Since I’m a Dodger fan, I thought I would do a short story-time segment in the fifth inning break, a la Vin Scully during his telecasts. At that time, Vin would usually have some fun anecdote that somewhat has to do with the game, or something about “this day in history.” For this time, I thought I would do a short story about the scorebook. For as long as I could remember, I’ve been attending baseball games. 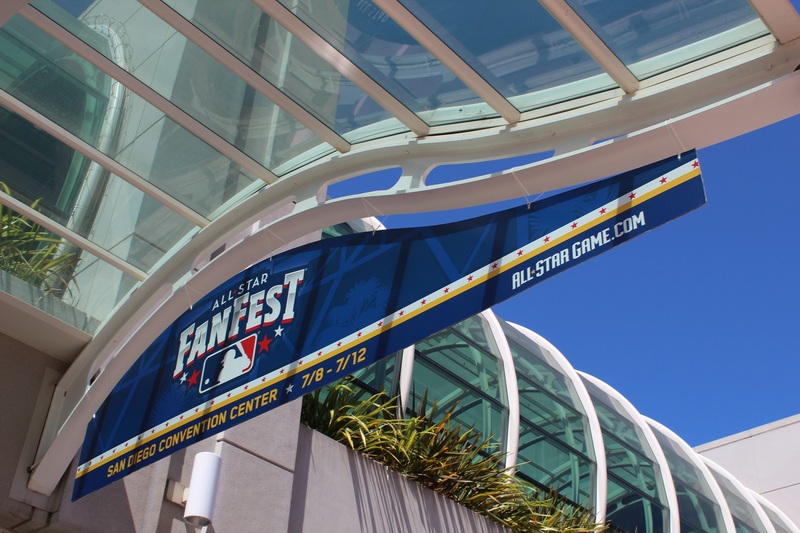 I got to see Fernando Valenzuela pitch one time, I got to see Denny Martinez’ perfecto in 1991, and got to see Nolan Ryan’s jersey retirement ceremony in Anaheim two decades ago. I still have the program and free book from that particular event. Those are all great mementos to have, but nothing beats the memories of the games, themselves. I’ve been scorekeeping at the games since I was still in high school, but only did that once in a while since I got more into the games before. 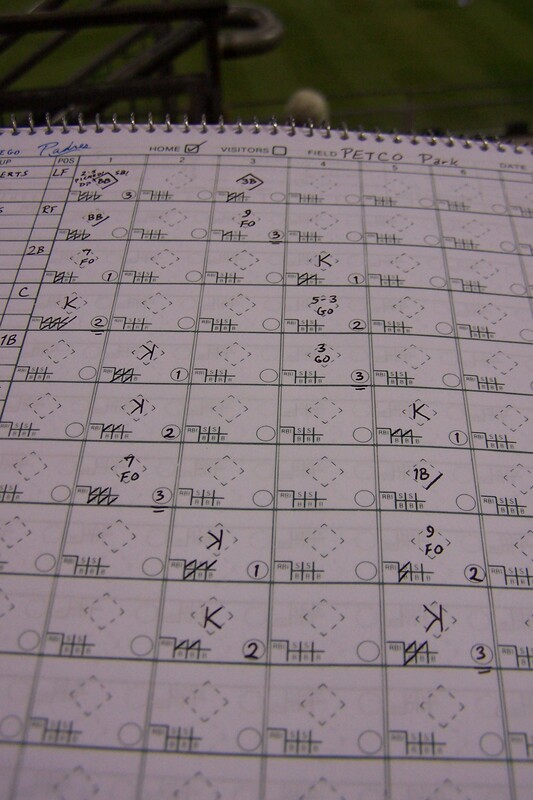 It wasn’t until I reached college that my scorekeeping really took off. I always used the same brand of scorebook from Big 5 Sporting Goods, but about five or six years ago, they stopped selling that brand. So, I did a little research and found the company that still made those scorebooks! These are the “What’s the Score” books that have many of the useful statistics without having too many weird columns here and there. It was simple enough to use right away, but not too simple that you only have the basic runs, hits, and errors like some of those ballpark scorecards offer. I bought ten in bulk, and gave half to one of my best friends. In a sense, my scorebooks tell a story of where I’ve been and what kind of awesome games I’ve seen in the past. I can always look back and say, “Oh yeah, I remember this game and how I felt at that time. Wow, what an amazing game.” I’ve attended some pretty great games in my time scorekeeping. I’ve seen some long-inning walkoffs, and even some record breaking games. I was at the final night game at “The Murph” in San Diego. 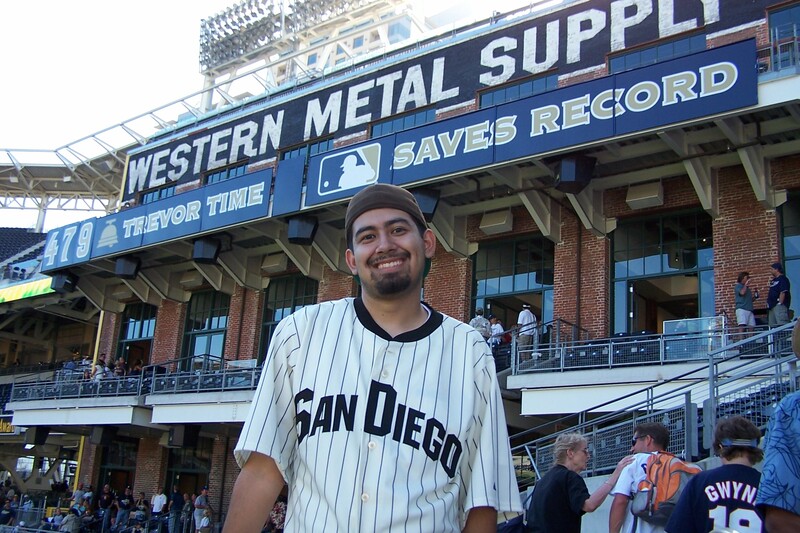 I witnessed Trevor Hoffman break the all-time saves record previously set by Lee Smith. I got to see Dennis Eckersley’s jersey retirement. I saw many of Eric Gagne’s saves as he racked up an amazing saves streak. 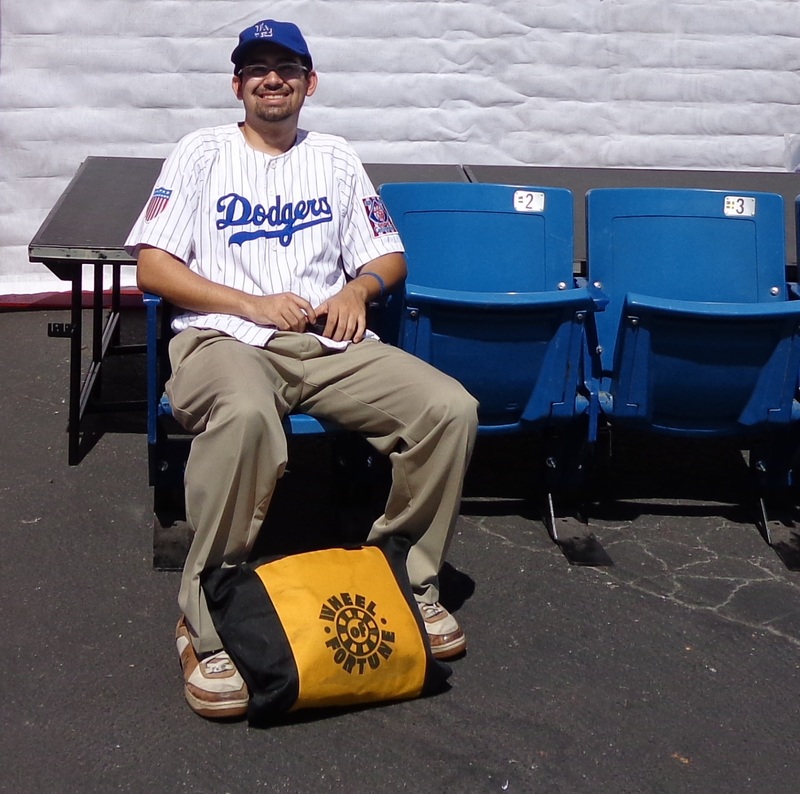 I even got to see an exhibition game at the Los Angeles Memorial Coliseum where the Dodgers first played when they moved to Los Angeles… and all its funky dimensions. Triple plays? Yeah, I’ve seen a few of those. A near no-hitter? I’ve seen a few of those, also. Oh, and some pitcher named Clayton Kershaw winning his 20th game of the 2011 season? I saw that, too. After the first scorebook, I would go to games early not for batting practice, but to try and get autographs. However, the first time I did this, I didn’t have anything for the players to sign except for my ticket. 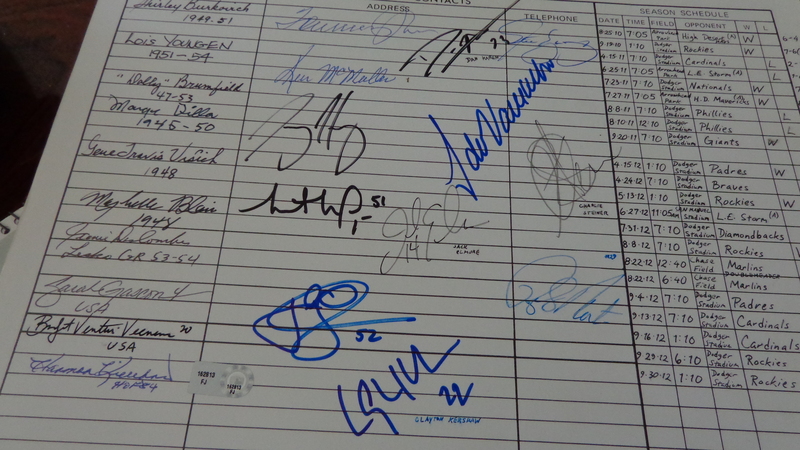 Then I thought, “why not have the players autograph the inside cover of my scorebook? Thus began the tradition of having players sign the inside of the scorebook I was currently using. Sometimes, the players would ask me about it, or say something like, “Okay… so what’s this all about? You’ve got an…. autographed scorebook?” Yes, I’ve gotten both of those during this season alone. As for the glove, that’s just good common sense! Almost every time I go to a game, I see a foul ball hit some poor soul square on the hand, and having that person’s hand feel like something stung them. Worse yet, I’ll see someone else try to catch it bare-handed only to have them mishandle the ball and have it go to someone else. Then there are other times where someone has a glove, and make an excellent catch. More often than not, the people who bring their own gloves are the ones who are more likely to get a souvenir via a foul ball. Therefore, I would carry both a scorebook and a glove with me to every game. Now the further question, where does all this stuff go? This is where I have to bring up my love of game shows. I’ve been in the audience for several game shows. I’ve also been on a few… my best appearance on a game show was on GSN’s “Lingo” back in the day where my sister and I won a good amount of money ($5,000). One of the tapings I would frequent is the classic game, “Wheel of Fortune.” During a taping, I won the door prize that included a tote bag with the show’s logo. I cherished this thing, and I even brought it to a ball game one time so I could bring a couple more pens along with the score book I already brought. Not long after that, I started bringing my glove and putting that bag to excellent use. Now I bring that Wheel of Fortune bag wherever I go, including the East Coast. It has become my baseball bag, despite having a game show logo on it. Now I understand some announcers (Vin Scully among them) like to bring their own bag, or design a hand hag best suited to their needs. While I wish I was able to design my own bag and use it, I am certainly not disappointed in the bag I’ve got. My Ballpark Tour is NOT over yet! I have added some dates to this incredible journey of mine. Thanks to some kind-hearted people, friends, and even family, there will be three additional ballparks I will be traveling to in the next couple weeks. Those parks include Coors Field in Colorado (for Todd Helton weekend), Globe Life Park in Arlington, and Minute Maid Park in Houston. Hopefully, even more people will read this, and I could visit more parks into the final month of the baseball season. For now, the trip continues! Thank you all for reading! So as I wrote on my last entry, Bill Russell was signing autographs and meeting people around town this Saturday morning. To say the least, it was an amazing experience. My mom got there pretty early, and there were only a few people in front of her, including a fellow Dodger blogger who happens to be among the top fan MLBloggers here! Anyway, my mom saved a spot for myself and my friend, Paul, and we got there around 9:40, with only a small handful of people behind us. It wasn’t until about 10am that the crowd started to form (and by crowd, I mean about 20 people). 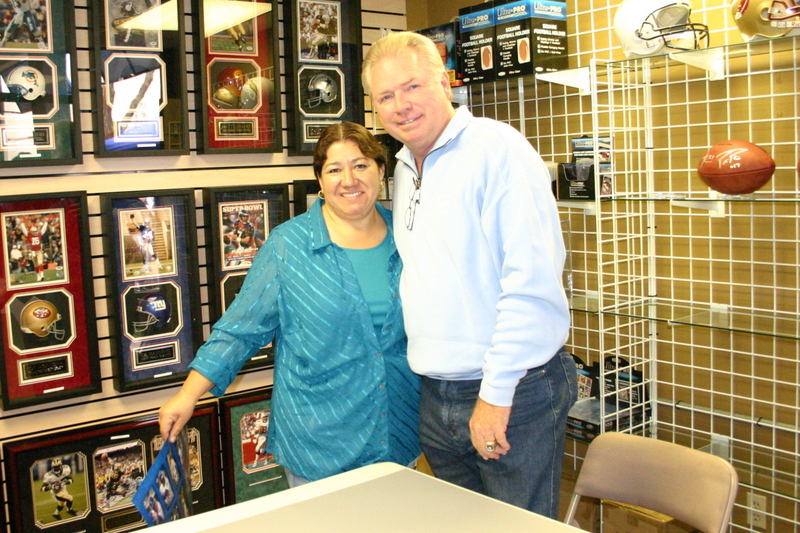 Fortunately, where the signing took place was literally down the street from where my mom works, and she was very excited to meet one of her favorite former Dodgers. Here is that picture after he signed the ’81 World Series poster. Yes, it was very cool indeed, and he was very excited to see the Dodgers ready to sweep the Cubs. This was a very fun morning, and now I’ll be headed to see my cousin, and then off to Dodger Stadium to see the boys in blue clinch their way into the NLCS! 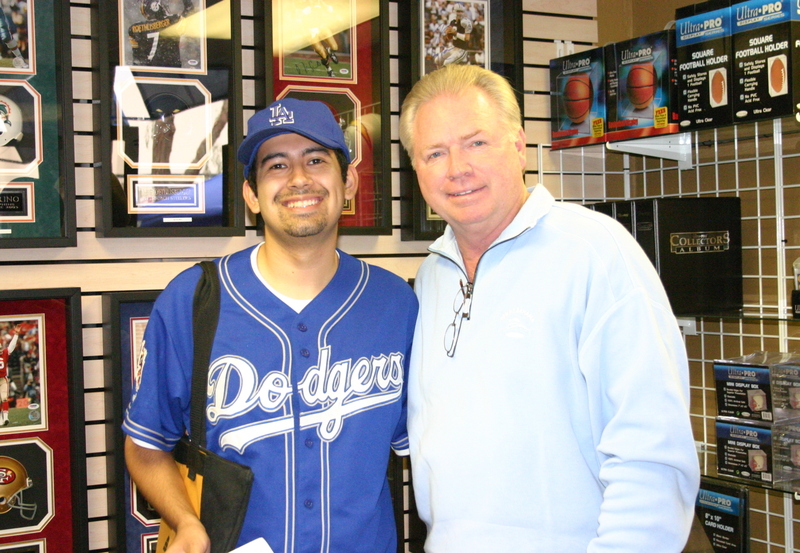 Good luck to the Dodgers tonight, and I’ll see you guys at the stadium, perhaps! Think Blue, and beat those Cubbies!